A jacket that resists flash fire and arc flash, but never hard work. It's not just what you want, it's what you need. Heavyweight, 13-ounce, 100 percent cotton FR duck, 11.5-ounce FR quilt lining-FR mod acrylic batting quilted to FR twill face cloth. Two inside patch pockets with FR hook-and-loop closures, nomex FR inside-waist adjustable draw cord, nomex FR rib-knit storm cuffs, two-way brass zipper with nomex FR tape plus inside and outside protective flaps with hook-and-loop closure for electric-arc protection, under-collar snaps for optional FR hood (fra265). Back length-large regular 31.5 inches-large tall-33.5 inches. 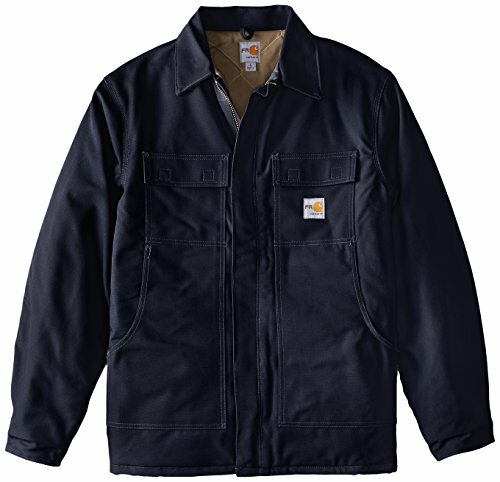 Carhartt FR and NFPA 2112/HRC 4 labels sewn on left chest pocket. Meets the performance requirements of NFPA 70E standards and is up classified to NFPA 2112.